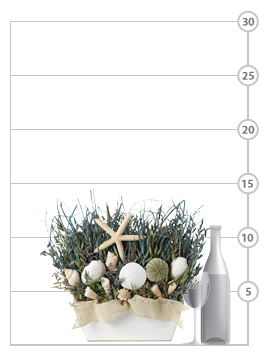 Conjuring the salty fragrance of sea spray, the hazy vision of a hot sun and the drumming of waves washing the shores; this beach-beautiful box does a lot more than make recipients feel gratitude, kindness or love. It gives them a serene scene. 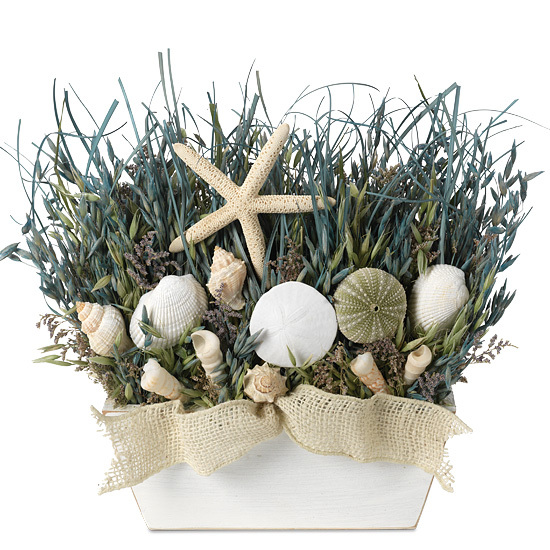 The whitewashed wooden box features natural and turquoise avena, turquoise grass, natural caspia, and naturally harvested starfish and seashells. Finished with a natural burlap ribbon. 270-Degree design is intended for shelves, mantles… anyplace against a wall; it is not a centerpiece. To remove, simply snip straps from the bottom of the box and lift the item gently. Our preserved designs are originally produced with extra elements so slight shedding during transit is normal. The colors will soften naturally over time. The designs are best maintained when displayed indoors, away from direct sunlight, strong heat sources, and extreme moisture. Please note: outdoor display is not recommended.